Welcome to the Hound Hotel, the five-star resort where pooches come to escape from the nuisances of humans who chuck balls for them to fetch and choke them on leads! The Hound Hotel has been created by Microgaming and spans 5 reels with 25 fixed paylines. You’ll join fellow guests like a Scotch Terrier and a Poodle as they relax with a variety of alcohol beverages to down and fat cigars to puff on and you’d be barking mad not to pay it a visit as it includes several bonus features as you get the chance to win up to 220,000 coins during your stay. There is an exciting Dashing Wilds feature to give you another opportunity of winning on random spins that did not result in a winning combination, plus there is a sensational free spins mode where you open a door on three floors of the hotel to reveal your Wild feature, multiplier value, and total number of free spins! At the hotel you’ll meet all kinds of upper class dogs enjoying their getaway with a Basset Hound sipping on a cup of tea, a Wolfhound who looks very dapper with a top hat for the evening’s entertainment, a posh Poodle dressed in pink wearing a lavish pearl necklace, a Scotch Terrier who is puffing on a pipe, and a Pug enjoying a glass of wine as he puffs away on a fat cigar. It’s the Hound Hotel logo which is the highest valued symbol of all on the reels with five on a line resulting in a win worth 20x your stake, however it is also the Wild symbol with the ability to substitute for all except the Scatter, and it is also a Stacked Wild symbol in the base game. You’ll be greeted to the hotel by a waiter who acts as the Scatter symbol, plus there are also Ace to Jack playing card symbols. Hound Hotel is all about the incredible free spins feature which is triggered by having the Scattered Hound coming knocking on the reels three or more times on the same spin. You will also receive instant Scatter pays with the waiter showing up three times seeing you win 2x your stake, three appearances and you’ll enjoy 25x your stake, and five will see you scoop a massive 100x your stake, and that’s only the beginning. You then find yourself presented with three floors of the hotel and must select one of five doors on each of them in order to discover the perks of your free spins. First Floor: On the first floor you’ll be revealing the special Wild feature which will be active throughout your free spins, which will be one of the following five. It’s also worth noting that an extra pick can be awarded behind random doors on the second and third floors, meaning you could enjoy even greater multipliers and number of free spins than you initially reveal. If you spin the reels of Hound Hotel in the base game without creating a winning combination you could see a trio of Wild symbols dash across the reels and take up random positions. This is a nice little touch which often results in winning combinations being created to see your disappointment vanish, plus it does actually occur quite frequently on non-winning spins. 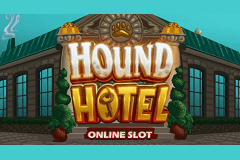 You can’t help but enjoy your stay at the Hound Hotel thanks to the friendliness of the other guests, the Dashing Wilds feature, and most importantly, the incredible free spins feature which will see you checking in over and over again!